A crop farmer and recipient of USDA farm subsidies works to prepare equipment for evening planting of corn in Hull, Sioux County, Iowa, April 2011. Inclusive progressive solutions are key to addressing the structural racism of previous U.S. farm policies—something that nearly wiped out black farmers. In January 1865, when Union Gen. William T. Sherman issued an order to allocate 40 acres to each freedman, the black ministers who lobbied for the policy envisioned vibrant, self-governed black agrarian communities dotting the Southern countryside. Unfortunately, President Andrew Johnson’s revocation of this order later that year and the institution of the Jim Crow regime after reconstruction left rural black Americans to build their farming communities from scratch.1 It wouldn’t be the first time that the U.S. government worked to undermine black farmers—and it certainly won’t be the last. The impact of structural racism—or systematic discrimination by private and public institutions—over the course of U.S. history on the wealth of black families is staggering. Black households hold about 10 percent of the wealth of white households.3 These inequities reflect the lasting impact of slavery, as well as impacts of exclusion from government policy initiatives aimed at promoting economic opportunity.4 The most widely known example of this is redlining, a policy instituted by the Home Owners’ Loan Corporation in 1933 that declared that mortgages in black neighborhoods were too risky—thus denying black Americans the opportunity to build wealth during the 1950s middle-class boom.5 The U.S. Department of Agriculture (USDA) has a long and well-documented history of discrimination against black farmers.6 The unequal administration of government farm support programs, crucial to protecting farmers from an inherently risky enterprise, has had a profound impact on rural communities of color. At a time when the national conversation has turned to the precarious situation of rural American farms, policymakers must pay special attention to the plight of the most vulnerable farmers—black farmers. This report looks at the history of how U.S. farm policy and private lending institutions have discriminated against black farmers, contributing to the virtual elimination of black-owned family farms. From 1920 to 1978, black farmers lost more than 36 million acres of farmland.16 This loss has had a profound impact on rural black communities, which today suffer from severe economic challenges, among them a poverty rate twice that of rural whites. Although concerted efforts at the federal level have helped reverse black farm loss in recent years, federal and state lawmakers must push reform efforts, including targeted USDA programs, to continue the push for racial parity when it comes to the treatment of farmers. The federal government must ensure that black farmers have expanded access to land, that legal protections are in place to preserve it, and that black farmers have the legal and technical resources to thrive. Despite the incalculable damage of slavery, Jim Crow, and the continuing discrimination faced by black Americans, inclusive progressive governance, informed by history, can begin to make amends. Intentional federal policies aimed at preserving black land ownership and expanding opportunity for black farm creation and growth can reshape rural America by building wealth and strengthening communities. Following the Civil War, white landowners and merchants systematically denied black farmers access to private credit, while the government denied black farmers access to government services. White landowners refused to rent farms to black Americans on the same terms as white men, instead offering them exploitative sharecropping or rental arrangements. At the same time, merchants denied blacks access to credit to grow anything but cotton, while others denied their warehouse services to black farmers.17 White farmers, on the other hand, were given access to credit and used the money to rejuvenate their soil through crop rotation; they stored their excess cotton as they waited for prices to improve. As a result of these and other practices, many black farmers found themselves squeezed financially, were unable to pay off their mortgages and other debts, and were forced to sell their land for a fraction of its value.18 Yet even in the face of this adversity, black farmers had amassed millions of acres by 1920. Unfortunately, a series of discriminatory choices made by federal policymakers and agency administrators undid this progress. The government sector systematically denied black famers access to wealth building programs. The federal government’s New Deal farming programs—the first set of major federal farm policies—intentionally excluded and discriminated against black farmers. During the Great Depression, the Agricultural Adjustment Act of 1933 (AAA) sought to raise and stabilize farm commodity prices by reducing production. The federal government incentivized farmers to produce less by providing rental and other benefit payments to those who withdrew acreage from cultivation. However, the lack of outreach to tenant farmers—with little regard for their rights under the AAA—coupled with higher levels of illiteracy among black tenant farmers, led to black tenant farmers being exploited in huge numbers by white landowners.19 For example, white landowners often pocketed government benefit payments for decreasing acreage under cultivation, instead of distributing that money to their sharecropping tenants. The U.S. Department of Agriculture’s Cooperative Extension Service was created in 1914 to work directly with farm communities to increase acreage, promote farm management practices, and promote other skills to help families maintain stable farms.22 During this time, the USDA advocated that a segregated extension service would best serve black farmers, with white agents working with the landlords and managers instead of directly with the black tenant farmers and sharecroppers.23 Black extension service workers were unable to help black sharecroppers and tenant farmers if white landlords objected to the black service workers’ presence on their land. Although these victories represent a step forward, cases of discrimination by public and private actors still exist. For example, the Provost family, black cane farmers based in Louisiana, said they suffered discrimination, fraud, vandalism, and retaliation after they filed a lawsuit against First Guaranty Bank on September 21, 2018. The Provosts allege that the bank and the USDA denied them necessary crop loans to maintain their sugarcane farm and as a result, they were forced into foreclosure.56 Initially, a whistleblower informed the family that staffers within the USDA were forging their signatures to make it seem as if the Provosts had agreed to lower loan amounts.57 The Provosts claim that both public and private actors are working to move the family from their farm. The lawsuit is still ongoing. Even post-Pigford, black farmers such as the Provosts need more protections against discrimination. Progressive efforts, such as those taken under the Obama administration, to address past discrimination and level the playing field for black farmers are turning the tide. 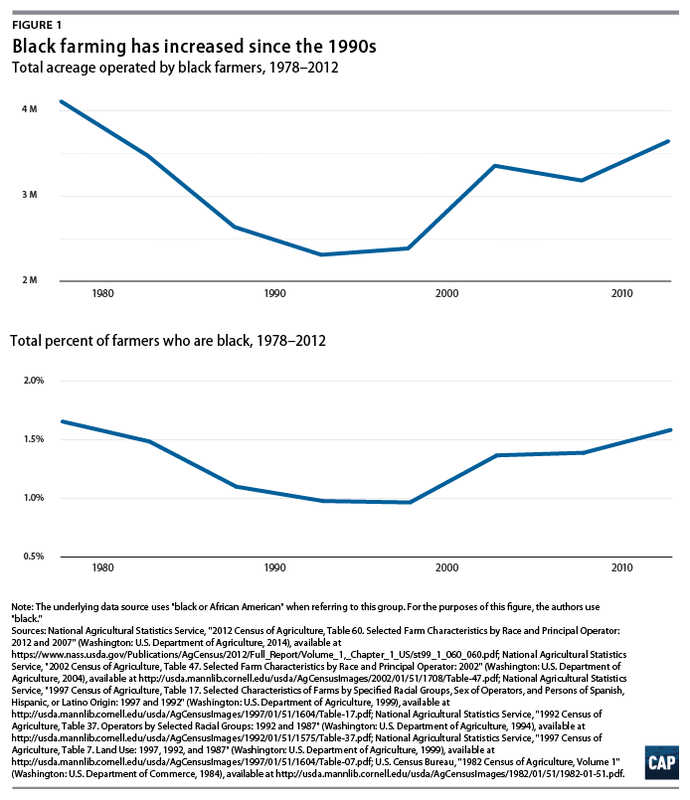 Even as the total number of American farms has decreased, black farmers have experienced a resurgence.62 According to the 2012 Census of Agriculture, 1.6 percent of farmers are black or African American, up from less than 1 percent in 1997.63 Moreover, black farms grew from their low of 2,310,349 acres in 1992 to more than 3,600,000 acres in 2012.64 While the United States has made gains in the battle for equal opportunity for black agricultural communities, there is still more work to do. Only sustained federal, state, and local commitment to black farmers will ensure that black farms are preserved, that beginning farmers of color have access to affordable land and technical assistance, and that USDA programs are implemented equitably. In 2018, for example, President Donald Trump nominated Naomi Churchill Earp to be the USDA’s assistant secretary for civil rights. In January 2019, after Churchill Earp’s Senate nomination for assistant secretary for civil rights expired with the end of the 115th Congress, U.S. Secretary of Agriculture Sonny Perdue selected her for deputy assistant secretary for civil rights, which is not a Senate-confirmed position.69 Prior to her current appointment, Churchill Earp served as director of the Office of Civil Rights at the USDA from 1987 to 1990.70 During her tenure, USDA employees allegedly threw out civil rights complaints.71 In addition, Churchill Earp has a well-documented history of slowing down civil rights complaints processes at the National Institutes of Health in the 1990s; she also instituted an unofficial white male affirmative action program to hire more white staff members.72 These actions are inconsistent with the mission of the Office of the Assistant Secretary for Civil Rights. While progressive policymakers have made strides in addressing past discrimination against black farmers and the loss of land and wealth that resulted from it, only continuing commitment will make a lasting difference. Below are four strategies that federal lawmakers can employ in developing progressive policies to preserve and build the wealth of black farmers and their families. These policies would not only help black farmers but also help farmers of color more broadly, and they can ensure that the U.S. farm-owner population is more representative of our diverse nation. The most pressing policy priority for lawmakers should be the restoration and preservation of black-owned land. Given the aging demographics of farmers broadly, 70 percent of farmland will be sold or transferred in about 10 years.73 As viable farmland becomes more expensive and scarce, access to land is a crucial issue for beginning farmers or small farms looking to expand to a more sustainable size. The federal government need not wait for the courts to direct it to pay settlements to black farm families who have lost their legacy and way of life due to discrimination. Congress should create a progressive land trust that buys land from farmers looking to retire and set it aside for beginning farmers of color, who could purchase the land at a subsidized rate. Finally, the USDA must create a task force dedicated to estate planning for socially disadvantaged farmers who have no living will, ensuring that the next generation gets a chance to carry on the family legacy. While heirs’ property now enjoys recognition by the USDA and is eligible for Farm Service Agency loans, commodity subsidies, and other programs, property without a formal title is still vulnerable. Outside investors can push partition sales of heirs’ property without the consent of the whole family that lays claim to the property. If one plot of land has multiple owners and one heir wants to sell, for example, a judge can force the sale over the objections of the rest of the family. Federal and state lawmakers should pass legislation that protects farmers from forced partition sales of their operations. One such law is the Uniform Partition of Heirs Property Act, enacted by a handful of states.74 This law requires that courts provide heirs with an opportunity to buy out the share of the person who wishes to sell and instructs courts to consider the noneconomic value of the property, including its cultural or historical significance, when deciding whether to order a partition sale. Finally, the law requires that the property be assessed by a neutral third party and publicly listed.75 These provisions, adopted at the state or federal level, are progressive steps forward to preserving the wealth of black farmers and farmers of color more broadly. In addition to these laws, Congress should establish USDA offices specifically tasked with providing legal assistance to farmers of heirs’ property. Public funding for agricultural research and extension services that bring research findings to farmers must receive full mandatory funding at both the federal and state levels. Research and education in the public interest is crucial to the survival of family farms. The USDA has a handful of programs dedicated to supporting “socially disadvantaged” farmers and ranchers. The mission of the Outreach and Technical Assistance for Socially Disadvantaged and Veteran Farmers and Ranchers Program—sometimes referred to as the 2501 Program—is to ensure that technical assistance and education efforts reach farmers who have been historically excluded from extension programs. The USDA Minority Farmers Advisory Committee advises the administration of the program to ensure that it is conducted in an inclusive and culturally sensitive way.76 Examples of projects that benefit from this program include workshops that inform farmers about conservation farming practices, estate planning, and heirs’ property law.77 However, no program specifically addresses the needs of farmers of color. A progressive farm bill must include mandatory funding for research dedicated to identifying challenges unique to black farmers and farmers of color more broadly, as well as quality solutions. Progressive governance demands transparency and accountability. 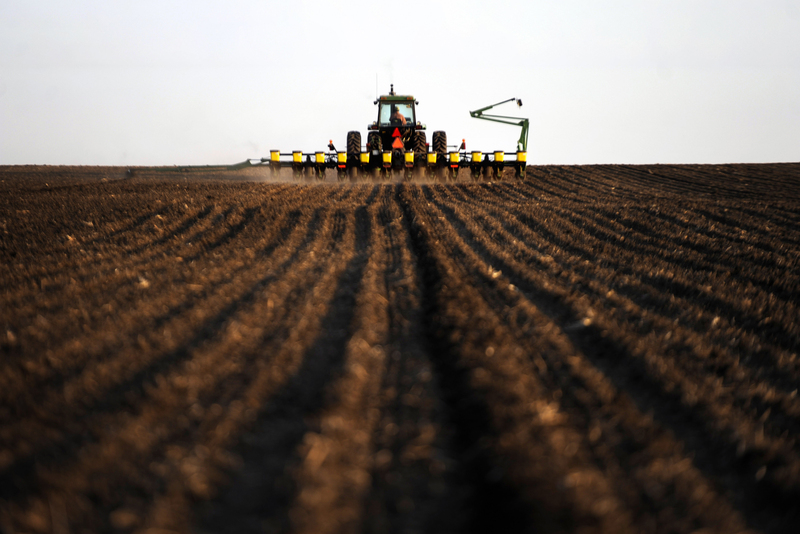 The Government Accountability Office (GAO) should regularly audit the USDA to ensure that it is processing and approving loans to black farmers at the same rate as white farmers. Additionally, the USDA should create an online civil rights complaint database that will be jointly monitored by the GAO and periodically publish statistics about the speed at which the complaints are processed, the number of complaints found to have merit, and the number of pending complaints. Finally, Congress must ensure that the USDA’s Office of Civil Rights is sufficiently staffed to process these complaints. At its core, government is a tool that helps distribute power by structuring the rules of economic and political systems. For too long in the United States, that tool was used to discriminate against black farmers in favor of their white peers. Yet with a race-centered approach, that same tool can be used to improve the economic well-being of black farmers, creating a system that gives them a fair chance to build a good life for themselves and their families. In fact, policymakers have a moral imperative to restore the wealth and land lost by black farmers because of government action. Federal farm policy has been crucial to the survival of family farms, providing indispensable backstops against unpredictable weather and commodity market fluctuations and protecting farmers from abusive agribusiness market power. Although in previous years, those policies intentionally discriminated against black farmers, good governance has begun the process toward ensuring equality. Government action, and in some cases inaction, over decades resulted in black farmers losing millions of acres and billions of dollars in wealth. In recent years, however, the U.S. Department of Agriculture has made strides toward increasing black farming and improving the local administration of related programs. Progressives, particularly those who believe in the value of family farms and understand that they are cornerstones of rural economies and culture, must push back on Trump administration efforts that would take the USDA backward. Policymakers must instead champion efforts that continue to build on the racial progress that has been made. Abril Castro is a research assistant for Race and Ethnicity Policy at the Center for American Progress. Zoe Willingham is a research assistant for Economic Policy at the Center. The authors would like to give special thanks to Webster Davis.